Low cost water ozonator air ozone generator machine keeps aquarium, pond, home spa clean, reduce, eliminate chemical. Mini-Spa air water ozonator, ozone generator machine, design works most existing spa injector system. Alternately, one can use an air pump to supply the spa water ozonator machine with air. 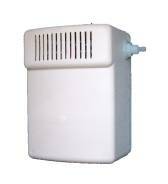 There are other applications for this unit such as aquarium, household drinking water, or smaller ponds. It will produce about 1500 milligrams/hour o3 from oxygen (2 to 15 gamma) at 1 to 2 liters/minute. Output at 1/2 liter oxygen is 7 gamma. Genuine corona discharge ozone generator machine. No more chemicals or bad smells. Does not discolor hair or dry your skin. There is no undesirable chemical smell or taste. Mini-Spa ozone generator machine or spa water ozonator can reduce or eliminate allergic reactions to chlorine compounds. Mini-Spa ozone generator machine is far more cost effective than traditional chemicals. Mini-Spa ozone generator machine and spa water ozonator will kill bacteria and viruses in your spa. PH neutral and will not adversely affect the acid/alkaline balance of spa water. Mini-Spa water ozonator destroys organic matter that can cloud the water or stain the spa surface. Mini-Spa water ozonator and ozone generator machine will extend the life of the spa water vessel and equipment because it is impossible to over treat the water. Mini-Spa water ozonator machine will make your spa water sparkling clean and crystal clear.